We present diverse choice of Studded Rings appropriate for all occasions be it wedding, engagement or some other events. We offer our diamond studded ring for both the ladies as well as gents use. These studded rings reveal range of sophisticated designs of class and elegance. In addition to this we are one of the major stone studded ring manufacturers in India. © Copyright 2008 - 2010. 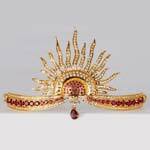 Swarnmandir Jewel Designer Pvt. Ltd.